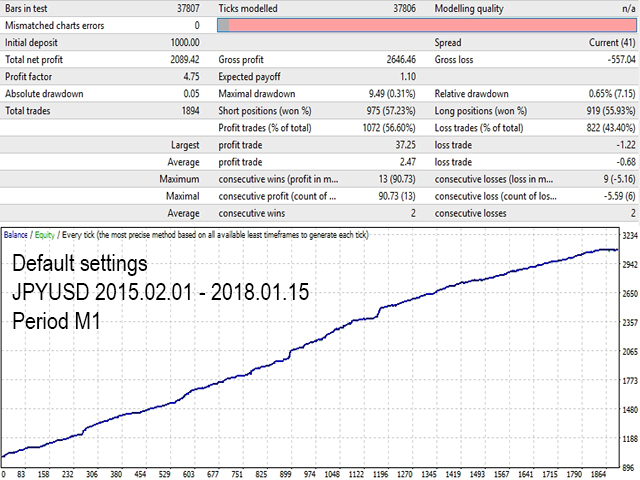 This Expert Advisor is designed for effective investment management and medium-term trading. Unlike the usual version of Butterfly, it starts working when the minimum required number of High/Low bars are within the specified price range. The strategy is based on the assumption that the market bounces in the opposite direction several times before the big bids are satisfied. 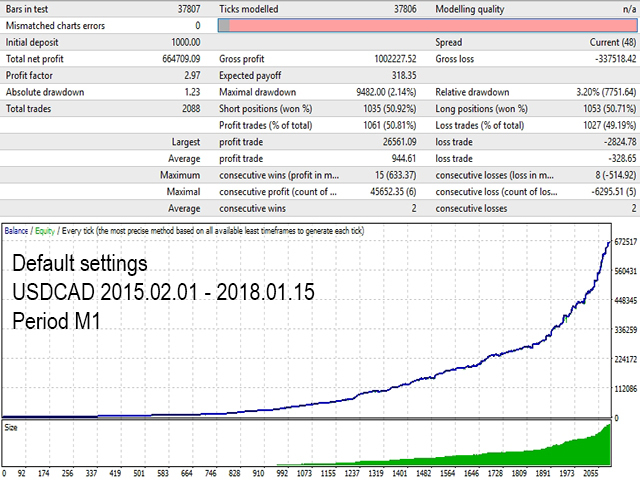 Do not use martingale, grid and other high-risk trading strategies similar to overstaying drawdown by keeping unprofitable trades. Every trade is protected by stop loss. Only one market order can be opened at a time. 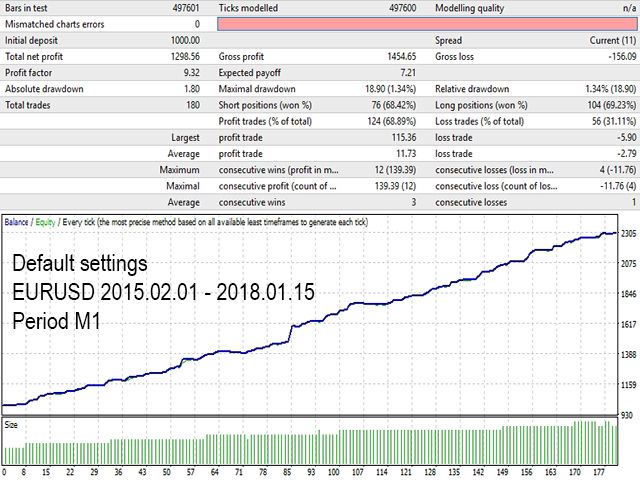 It works using pending (Stop, Limit) or market orders depending on the parameters specified. 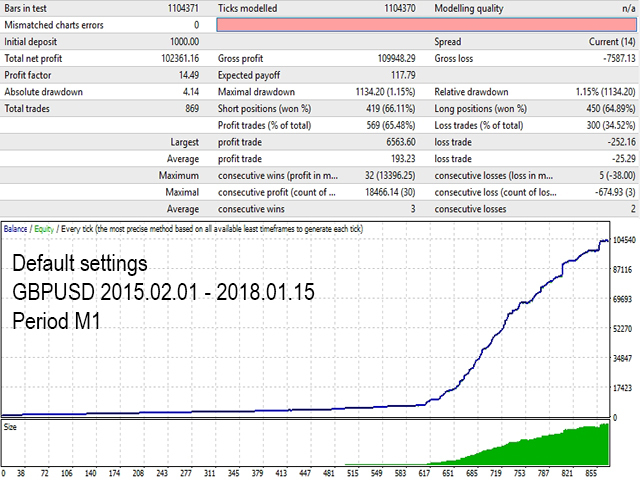 The trailing stop levels can be set in pips, in the deposit currency or as a percentage of the balance. VPS server is recommended. The recommended minimum deposit is 1,000 units of the base currency. 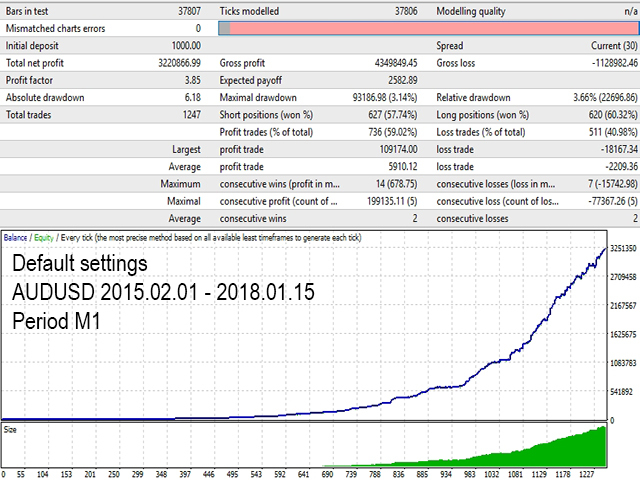 The EA is to be used on highly liquid currency pairs with a small spread/commission (for example, EURUSD, GBPUSD, AUDUSD, USDJPY, USDCHF, USDCAD, NZDUSD, XAUUSD), M1-M5 timeframe. 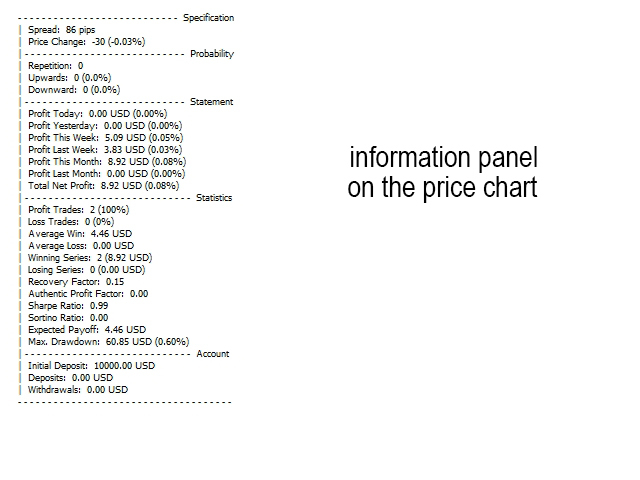 For the convenience of evaluating the efficiency of the trading system, various information is output on the chart. This EA is designed for long-term use, therefore, do not expect immediate results. There can be unprofitable days, weeks and even months. The number of trades mainly depends on the market volatility. Keep in mind that this is merely a program and not the Holy Grail. Only you should decide when and where to use it. Make sure you test the program in the strategy tester and understand all the settings before you make the purchase. Distance - the distance the price should pass. TimerSeconds - time to refresh the data in seconds. The smaller the distance the price should pass and the greater the allocated time, the greater the number of trades. Also, disabling the signal lifetime setting allows the EA to work using a simplified logic, which generates more trades but with a decreased quality. PriceRange - start 50, step 50, stop 500. CountBars - start 10, step 1, stop 20. CountHighLow - start 3, step 1, stop 10. LifeTimeSignal - start 10, step 10, stop 120. Distance - start 40, step 10, stop 200. TimerSeconds - start 10, step 1, stop 30. TrailingStop - start 40, step 10, stop 100. TrailingStep - start 40, step 10, stop 200. I decided not to overload this EA with a lot of functions, and equipped it with only the essentials. But, if you need something done additionally, it can always be done via the freelance service with prior negotiation. Please contact me if you have any questions. I hope, this product will be helpful. If you like my product, please leave your feedback. PctMaxLots - automatic calculation of the lot size as a percentage of the maximum allowed lot. 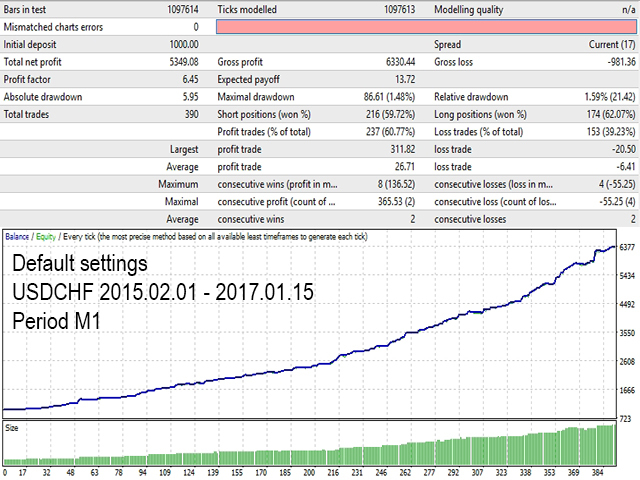 If set to -1, a fixed lot set in FixLots is used. PriceRange - price fluctuation range. CountBars - number of bars for calculation. CountHighLow - number of high/low bars in the range. TimeFrame - timeframe to gather statistical data. LifeTimeSignal - signal lifetime, in minutes. Not used if set to -1. Distance - the distance the price should pass within a certain time interval. 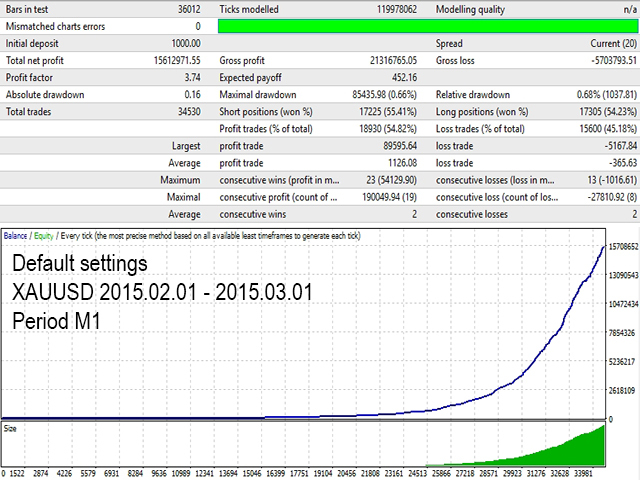 TimerSeconds - time in seconds, after which the data for opening positions are refreshed. Money - in deposit currency. MagicNumber - magic number, -1 - work with all orders. Symbol - output data on the symbol the EA is running on. Account - general statistics on the trade account. Useless, most of trade were lost, back tester quality is 25% and far from actual. The first reason for 5 stars is Vladimir. He is very helpful and responsive. Quick to resolve issues and advise. For now the EA runs fine. Need to run it a little longer to give full feedback.